A hard worker like you deserves some serious gear. Eligibility: Open only to legal residents of the 50 United States (& DC) who are 18 years of age or older. Entry Dates: June 28, 2010 and ends at 11:59 p.m. ET, August 30, 2010. How to enter: Visit www.drinkfullthrottle.com/promos.do and follow the links and instructions to register. Sweeties Note: You can skip the game right after you register or login. The words SKIP GAME are small, just under Worksite Wars Play to Win graphic. Entry Limit: 1 Sweepstakes entry and 1 Instant Win Game play per day. 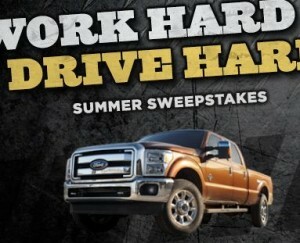 (1) Grand Prize: A 2011 Ford F-250 Super Duty®. ARV: $50,000. (2) First Prizes: $1,500 Mac Tools Gift Card. ARV: $1,500. (3) Second Prizes: Set of Goodyear Wrangler Tires (4) hardworking tires, including the new Wrangler DuraTrac all-terrain tire or the revolutionary Wrangler MT/R with Kevlar®. ARV: $1,000. (15) Third Prizes: Carhartt Twill Jacket. Size determined by Sponsor in its sole discretion. ARV: $75. (20) Fourth Prizes: Summit Racing $50 Gift Card. ARV: $50. (20) Fifth Prizes: Carhartt Bag. ARV: $40. (62) Sixth Prizes: Carhartt Hat. ARV: $20. (100) Seventh Prizes: Summit Racing Hat. ARV: $15. (750) Eighth Prizes: 1 Coupon for a Free Single Can of Full Throttle®. ARV: $2.19. Prize Limit: 1 Sweepstakes Prize and 1 Instant Win Game Prize per person. That “Skip Game” isn’t working for me. Everytime I login and then click “Skip” I don’t go anywhere. The screen won’t change. Just my luck, I guess. I won a summit racing hat the first time I played this ! lol that was my first win three weeks ! Some reason now it won’t let me skip the game. And when I do play the game, it doesn’t tell me I won something or not. I think this game just doesn’t like me. You can only refresh so many times. Just FYI, there’s only 1 First prize left… I won the $1500 gift card to Mac Tools! Thank you Sweetie!! I just won the Carrhart Jacket,Whoo Hoo!! I won a free can of Full Throttle and didn’t even know it. I just received the coupon. Too bad! This is the message I am getting now. “This promotion is temporarily offline due to technical difficulties.